The apparent suicide of an eminent psychologist prompts his teenage daughter (Pamela Franklin – The Prime of Miss Jean Brodie, The Legend of Hell House) and one of his patients (Stephen Boyd – Ben-Hur, Fantastic Voyage) to investigate. Convinced he was murdered, the two begin a journey into the lives and twisted psychoses of the doctor’s disturbed patients. 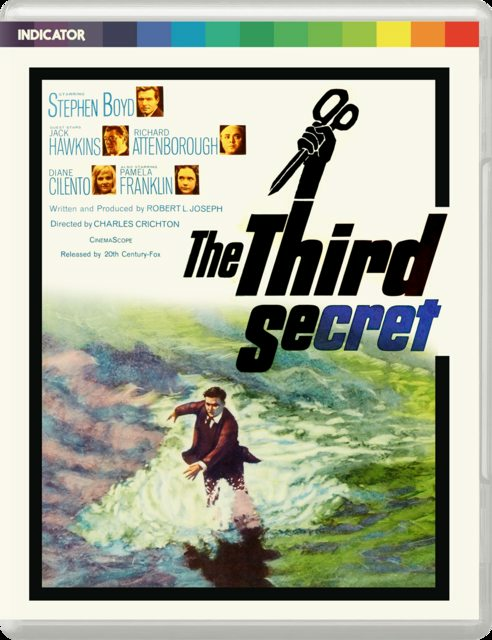 Directed by the great Charles Crichton (Dead of Night, The Lavender Hill Mob, A Fish Called Wanda), stunningly photographed by Douglas Slocombe (The Italian Job, Raiders of the Lost Ark), and starring an incredible cast which includes Jack Hawkins, Richard Attenborough, Diane Cilento and Judi Dench in one of her earliest screen roles, The Third Secret is a dark and elegant psychological thriller which has long been overlooked, but is now ripe for rediscovery. • Crichton on Crichton (2019): filmmaker David Crichton gives a fascinating biographical overview of his father’s life and work. Not a film that I've seen or even heard of before the Indicator announcement, but it sounds terrific on paper and I'll definitely be getting it. The extras look delicious too; I suppose the 'Part One' on the Douglas Slocombe interview suggests that there will be a Part Two - The Later Years on a future release. If I was a betting man, I'd put some money on Ken Russell's The Music Lovers - the Final Cut DVD release looks to be OOP. There will indeed be a Slocombe part two, hopefully later this year, although I'm afraid you'd lose your bet as The Music Lovers is with MGM and Indicator doesn't have a deal with them. MichaelB wrote: There will indeed be a Slocombe part two, hopefully later this year, although I'm afraid you'd lose your bet as The Music Lovers is with MGM and Indicator doesn't have a deal with them. And that's why I'm not a betting man! I was initially asked to cut both down to 103 minutes so that they'd play as quasi-commentaries, but while this was pretty straightforward with Crichton (which wasn't that much longer in raw form, and you honestly didn't need the lengthy and often highly speculative discussion about why Ealing really closed its doors in 1957: the mere fact that this happened was sufficient for narrative purposes), it was all but impossible with Slocombe, where there was easily enough good material to span two full-length features. So I pitched the idea of a two-parter and thankfully they said yes. Even more thankfully, there turned out to be a natural break halfway through the Slocombe material - part one covers childhood through WWII and Ealing (with a brief out-of-sequence flashforward to The Third Secret), while part two will be covering his international freelance career from roughly 1960 onwards, so they'll play just fine as separate listening experiences. I suppose it could be John Huston’s Freud, Joseph Losey’s Boom!, Robert Parrish’s The Marseille Contract, or Fred Zinnemann’s Julia? Unless it’ll be on Seth Holt’s Taste of Fear as part of one of the next Hammer sets? It will be a film shot by Douglas Slocombe between 1960 and 1988. And that's all you'll get out of me. Seriously, these posts are a complete waste of time. Not least mine.